Luke Wyatt never asked to trade fame and fortune for the only woman he's ever loved. Now that he's finished a punishing year-long national tour, all bets are off. He's coming back to his hometown of Whistle Cove for the quiet, the beaches, the inspiration, and the girl. Not necessarily in that order. There's pressure from Nashville to deliver more country gold like the #1 song he co-wrote with Lexi Wilder. With the first book in her new Wilder Sisters series, Heatherly Bell brings us Lexi’s story. We see her come face to face with her old boyfriend and get a front row seat as he tries to rekindle their flame. The premise of the story is interesting and the characters were quick to grab my attention. I would have preferred a little more depth to the backstory of their relationship and the timespan, etc. to give me a deeper picture, but overall a satisfying read. Looking forward to the sister’s stories! Country newcomer Luke Wyatt is coming down off of the high of his first big country-wide tour, and he’s exhausted. His body aches, his mind is burned out and his heart hurts from the empty hole she left behind. He knows he needs to get on the songs everyone is stressing him to write, but his first stop has to be home. Whistle Cove, California … and her. He has to make her see she’s everything … and then he can get back on the path of his future. 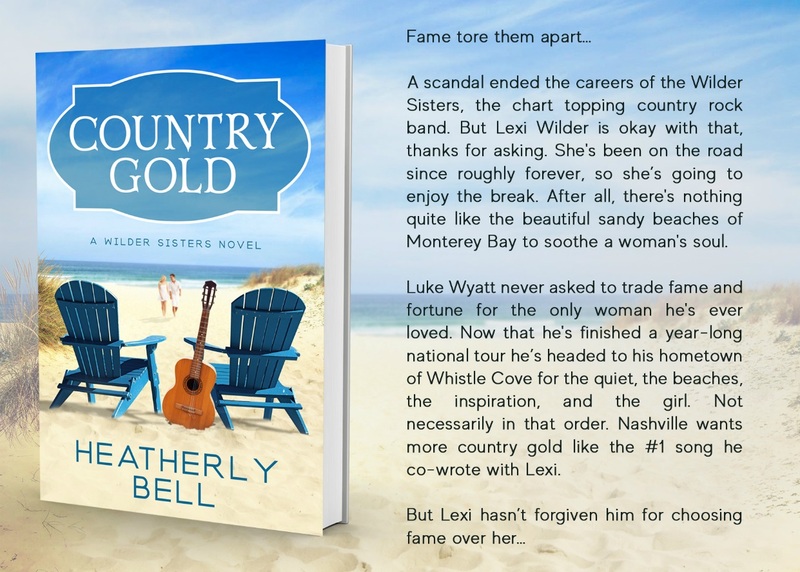 Lexi Wilder was once part of a big country sensation herself … until scandal brought them down faster than they could turn around. 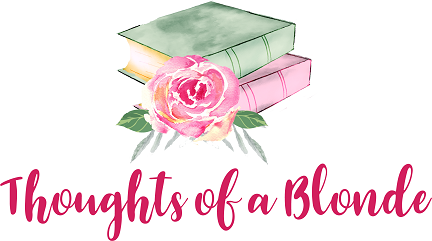 Now running her Gran’s B & B is keeping her busy while she pretends not to notice all the headlines about him … the one that was too busy to be bothered with her once she wasn’t there by his side anymore … the one who with all of the women clamoring for his attention. 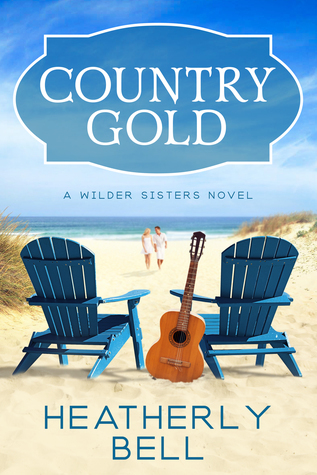 A scandal ended the careers of the Wilder Sisters, the chart topping country rock band. But Lexi Wilder is okay with that, thanks for asking. She’s been on the road since roughly forever, and even if the scandal has followed her home to Whistle Cove, California, Lexi is going to enjoy the break. After all, there’s quite nothing like the beautiful sandy beaches of Monterey Bay to calm a woman’s soul. Luke Wyatt never asked to trade fame and fortune for the only woman he’s ever loved. Now that he’s finished a punishing year-long national tour, all bets are off. 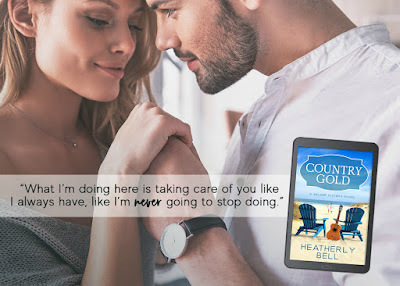 He’s coming back to his hometown of Whistle Cove for the quiet, the beaches, the inspiration, and the girl. Not necessarily in that order. There’s pressure from Nashville to deliver more country gold like the #1 song he co-wrote with Lexi Wilder. When she didn’t speak, but simply swallowed and blinked, trying like hell to regain her balance, he filled in the silence. She’d seen the woman practically on Luke’s lap at a televised awards show. And he was mad she hadn’t called him back? If he’d been hurt when she stopped taking his calls, he sure in the hell got over it quickly enough. Lexi did an internal face palm. No, no. It would not go this way. Check her out letting loose with all her pent up hurt and anger the minute he showed up, giving Luke every indication of how much she still cared about him. If she didn’t care at all, maybe the rumors of these women wouldn’t bother her so much. So she’d already blown her cover in the first twenty seconds of seeing him. Get a grip. She’d expected to do much better than this if she ever ran into him again, say in Nashville while visiting Miranda Lambert to collaborate on some songs. Lexi would have another hit song by then. Maybe she’d be dating another handsome country singer not named Luke Wilder. She’d be over him by then. Chalk it up to running into him so unexpectedly but this wasn’t how it was supposed to go. He shouldn’t still look so good to her, his beard making him look like a strong mountain man. Like a man who would take care of his woman. But the thing to do here was pretend it didn’t make a difference whether he stayed or left. Pretend he had that little effect on her. Maybe it wasn’t too late to salvage what little was left of her pride. Score one for Lexi. She’d shocked him. Good. “Pissy?” He gave her another smile, this one lifting both corners of his mouth and demonstrating he still had the power to render her speechless when he laid on the charm. Luke had a front row seat to the implosion of the Wilder Sisters. He’d been performing alongside them at the stadium in Oklahoma when Sabrina had her public mini-meltdown. Even though their demise as a band had meant his opportunity for stardom, Lexi didn’t doubt he’d been sorry about the way it had all happened. When she’d been worried about Sabrina, whose entire life from the time she’d been ten had been the stage, Luke had held Lexi every night until she fell asleep, assuring her that Sabrina would survive this. They all would. And she’d fallen even deeper for the man. Luke reminded her there would be life after all the speculation and rumors. Because Luke Wyatt knew a lot about scandal. He understood what it was like to feel like you had to apologize just for being allowed to breathe the same air as everyone else. The wall was still up and there it would stay. If anything, she’d wallpaper it. But she was a Wilder first and foremost, and yes, they could put on a show. His gaze took a slow slide down the length of her body and she almost felt…naked. She was so not going to be his inspiration. Not this time. He’d taken enough material from her already.